If you’re setting up a website for the first time, buying and setting up hosting can seem the most technically daunting of all the tasks that you have to do. The first time I did it, I had no clue what I was actually doing – but I got there in the end, and so can you. Before buying your hosting, it is important to understand why you need it and what to look out for when choosing a provider. When you build a website, your code will be contained in files and folders and they need to be stored somewhere. Usually, they’ll be stored on what is called a ‘server’. That server needs to always be online, safe and secure. This is what hosting companies provide. They essentially sell you space on their servers to hold the files and folders of your website. When you buy your domain name, you need to point that domain name to this allocated space on their server. There are thousands of hosting companies who offer a range of different types of hosting. It can get really complex. The bottom line, for most people starting out, is they need reliable and secure hosting which doesn’t cost a lot of money. It’s also useful if your hosting package has the capability of being able to add on other domain names, if you decide you want to add and build more websites in the future. The single most important thing is you will always want your website to be live, so people can find it and access it. Hosting companies refer to this as ‘up time’ and they should all guarantee 99-per-cent-plus uptime. There are always offers available and prices will vary depending on when you make your purchase, but the cost of hosting can be as little as £3 to £4 per month. There’s no need to pay any more than this to get a good-quality hosting service. As I have a number of websites, I use a larger package. However when I started out, I used a shared hosting package of the kind I’ve outlined above. When you start to build up more websites, it is a simple operation to upgrade to a larger hosting capacity. You can either buy your domain name and hosting from the same company, or buy the domain from one and hosting from another. It doesn’t actually make a lot of difference either way: I buy my domain names at GoDaddy, but I host my websites with another company, as I’ve always had a good experience with them. If you decide to buy your domain name and hosting from the same company, then when you buy your hosting, you simply add the domain name to the hosting package and your website is all linked up. If you buy them from separate companies, you have to tell the domain provider to point the domain name to your hosting server. This involves more work, but is still easy to do. For my website, I’ll be pointing my domain name to my Hostnine account, as that’s the hosting company that I am with. As with your domain name, you’ll need to create an account with your chosen hosting company. All you do is go to their website and register. If you decide to buy the domain and hosting from the same company, then you just need to set up one account. If you want to keep them separate, you’ll need to set up an account for the domain and one for the hosting. When you register, pick the package you like the best. Just remember, if you think you might build more than one website, then get a package that allows unlimited domain names. I’d recommend a shared hosting package when starting out, as explained above. Then you pay for your package, and you receive an email from your hosting provider that contains important information. It will have your login details, the Nameservers and FTP details. For now, the login and Nameservers are all that matters. With many UK hosting providers, you’ll also find a live chat service on the website. They are very helpful and can guide you easily through this process. If you opt for the same account for the domain name and the hosting, all you have to do is simply add the domain name to the hosting and you are finished with the setup. The company you choose will help you through this process. Then login to your domain name account and find a tab labelled something like ‘Manage Domains’. In the image below, my domain is with GoDaddy and under the domain name, you see settings, and under that, Nameservers. They’re always set as a default of domaincontrol.com. This is what needs to be changed. You can see my new domain is pointing to two Nameservers, which are not where I want them to be. To point them to my hosting Nameservers, I just click on the ‘Manage’ link in the Nameserver’s section and a screen like this will appear. 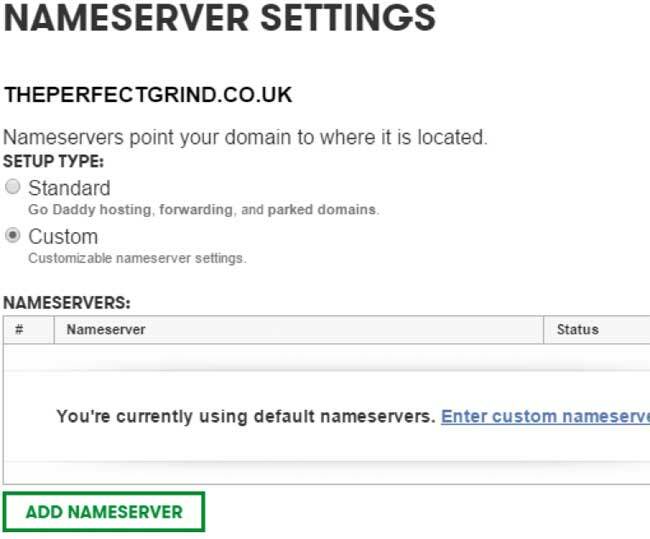 I then change the setup type from ‘Standard’ to ‘Custom’ and click ‘Enter Custom Nameservers’. I then add my own Nameservers from my hosting company and click ‘OK’. It can take up to 24 hours for that to happen, but I find it’s always done in under an hour. You’ll receive another email from your domain provider telling you that the change has been requested. When starting out, keep it simple and don’t get over-technical about this. The hosting providers I have shown all have UK helpline phone numbers, so give them a call. Tell them you’re starting out and want a simple package. 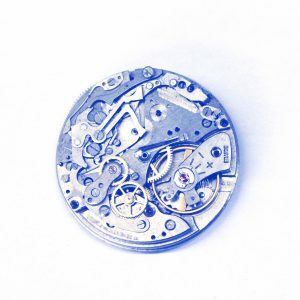 They’ll walk you through the process – it’s actually rather simple. The important thing here is not to get stuck on this if you come across any problems. Get in touch with the helpdesk and they’ll fix any problems for you very quickly. Almost every hosting company uses what is called a cPanel to allow you to control your hosting account. When new people first log in to this, it looks like something out of Star Wars. Please do not be put off, because it is, again, straightforward to use when you become acquainted with it. In here, you can install your CMS (Content Management System), set up your email accounts, and add sub-domains and a range of other features. All I ever do is log into my hosting account, add the domain name, set up an email and install WordPress as my CMS/account-management system. Depending on which hosting provider you choose, the cPanels will all look slightly different in design, but will all contain the important elements. If you have your domain and hosting with the one provider, this is simply a matter of adding the domain to the account. There will be how-to tutorial videos showing you how to do this, or you can call them. If you have different companies, then your hosting company will have a video showing you how to add a domain from your cPanel. It’s normally a button that says ‘Add Domain’. Click that and follow the instructions. All that is required is to add your new domain and click ‘Add’. I always set up an email account and on my website, I’ve set up ‘enquiries@the perfectgrind.co.uk’. 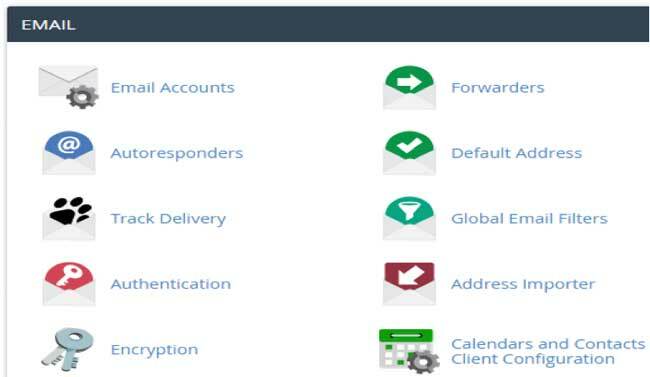 The image below shows a snapshot of my cPanel and the Email Accounts button. Other cPanels may look different, but all will offer the facility to create and manage email accounts. This email will be used on my website on my contact page when we build the website. Again, this is a simple process, as you will be asked which email you want to create, such as ‘info’, ‘enquiries’, ‘support’ or anything you choose. The email address then becomes info@whateveryourdomainis.co.uk. All you have to do is set a password and your email will be ready. You can then read any emails by using a browser-based email from within your cPanel, or set it up to link into a main email service, such as Microsoft Outlook. In the next section, I’ll show you what WordPress is and why I install that as my CMS of choice. To build your own website, you need to buy a domain name and hosting. For some people, this seems dauntingly technical; but it is just a process that needs to be followed. In my case, I bought the domain name theperfectgrind.co.uk. Buy a simple and cheap shared hosting package for around £3 to £4 per month. You can buy your domain and hosting from one company, or buy the domain from one company, and the hosting from another. On the cPanel of your hosting account, you will need to add your new domain and also set up an email address. When that is done, it’s just a matter of installing a CMS such as WordPress, which I cover in the next section – and then the real fun begins.